One of the (many) things I adore about Halloween is the makeup that goes along with the costumes! Makeup can make or break a costume, so it's important to get it right...luckily, there are many amazing makeup artists who upload Halloween makeup tutorials that show you step-by-step how to create creepy Halloween makeup looks. I posted vids last year HERE, go check those out as well! These are all amazing! I'm familiar with MissChievous from YouTube. She does some of the best makeup tutorials on there. I could watch YouTube makeup tutorials all day! It's actually dangerous for me to sit down and watch these, because time gets away from me. :) The Lily Munster tutorial is awesome! I want to try some of these looks. Sweet tuts. 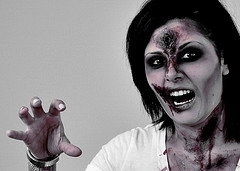 Great fx makeups. We gotta Hallowe'ed theme thirsty thursday this week, I'm thinking of doing a Pierrot makeup.